Understand the documents that made America the nation it is today! The Declaration of Independence, the Articles of Confederation, the Constitution, and the Gettysburg Address: these documents have all helped define the fundamental laws, beliefs, and history of the United States. Each one served a different function and altered the way Americans perceived their country. 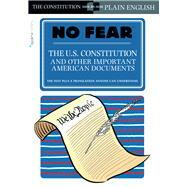 This No Fear compilation presents their original texts side-by-side with modern translations; it doesn’t interpret—especially where the writers have deliberately left things vague—but simply modernizes the language so readers can draw their own conclusions. There never was a better, more necessary time for this illuminating book.